Hyacinths are one of the most popular flowers grown in spring. They have a pleasing aroma and the flowers are classic and tightly packed. The bulbs bear thick, crowded spikes of flowers which are usually 9 inches long. The spikes hold flowers which are shaped like stars. Usually, one bulb bears only a single spike. The leaves are long, narrow and thin, similar in shape to a sword. The green leaves are folded lengthwise. Hyacinth can be found in a wide array of colors like pink, blue and yellow. They can also be found in other colors like shocking pink, lilac, claret, light red, purple, and even white. Hyacinth has its origins in the Mediterranean region, especially Africa, Iran and Turkmenistan. Hyacinth belongs to the genus Hyacinthus and the family it joins is Liliaceae. Hyacinth is the name shared by nearly 30 flowering plants. All of these plants are perennial. History: Hyacinth is known to be prevalent on the surface of the earth before 4000 years. They were grown in the Europe during the time when the Rome ruled the world. It has been found that Virgil acknowledged the sweet fragrance of the flower. Hyacinths have been commercially grown since the 1650s. During the 18th century, Hyacinth gained a widespread, wild popularity in Europe. They were loved by everyone and were sought after. They yearn and demand for this flower was so high that the Hyacinth bulb was sold for a huge sum of money. These flowers were used everywhere from gardens to the women‘s costumes. It was also grown in France by the mistress of King Louis XV in the gardens of Versailles. Today, Hyacinth are commercially cultivated in the Netherlands and the United Kingdom. March 7th is declared as the world Hyacinth day. Mythology: As stated by the Greek mythology, Hyacinth was a prince of the kingdom Sparta. He was handsome and kindhearted. Zephyr and Apollo, who were the gods of the land admired Hyacinth very much. But hyacinth had a deep love for Apollo only. One day, Apollo and Hyacinth were playing discus in the lush meadows. Zephyr was jealous of the sprouting love between Apollo and Hyacinth. Zephyr was the god of the west winds and he used his power to create fight between the two lovers. In the meadow, Apollo would throw the discus and Hyacinth would try to catch it. At one time, when Apollo threw the discus tat Apollo. Zephyr being the God of wind pushed the discus to another direction and it hit Hyacinth. The discus hit Hyacinth right in his head and he died there. Apollo was deeply hurt by the incident. Apollo created a flower called Hyacinth at the spot where he died from the spilled blood of Hyacinth. It is rumored that Apollo’s tears stained the flower and that is why the Hyacinth we see today is stained. Variety: Hyacinths are found in a variety of colors. From white (Carnegie) to black they can be observed in almost all colors. The flower named City of Haarlem is very famous for exhibiting a bright yellow due. If one wants a light pink color then the flower named Pink Pearl is just the right choice and if they want a deeper pink, they can choose the flower named Amsterdam. Delft Blue is famous for its blue hue. Some of the flowers belonging to Hyacinths bear loose spikes and are hardy while the others like Roman hyacinth bears looser spikes of flowers. Hyacinths can be grown in a wide range of environments of the Mediterranean region. Hyacinths can be classified into three categories, namely single, double and multiflora Hyacinths. Multifora Hyacinths is different from the other two as in this case one bulb can give many flower stalks while the bulbs of the single and double variety give only one stalk. The single Hyacinths like the Blue Diamond are the most classic and good looking while the Multiflora Hyacinth is the least formal. Cultivation: Hyacinths can be grown outdoor as well as forced indoor. Growing them should not be a tough job and here are the tips to make things easier. The first job when planting is to select the right bulb. A solid, fat bulb should be chosen and the pest resistance of the bulb should be checked. Moreover, if the bulb has some bad smell then that bulb should be neglected. Hyacinths give the largest blooms when planted in the bright sunlight. They should be planted in fall 7 weeks before the arrival of frost. The soil should be loose and mixed with 2 - 4 inch farmyard compost. A hole of depth 7 inch should be dug. The bulbs should be put in the hole with the pointed side facing up and left after covering it with soil. The bulbs should have a constant gap of 6 inches between them. The Hyacinths should be watered everyday. No diseases are seen in the plant if care is taken to keep it well-drained all the time. Compost can be added to the flower to ensure maximum bloom. To maintain more growth and blooms the flowers they can be deadheaded which refers to the pinching off of old blooms. In an area where winter is cold, the bulbs don’t need to be dug out of the soil and stored. However, if the winter is not cold the bulbs should be dug from the soil and kept in the refrigerator. To maintain more growth and blooms the flowers they can be deadheaded which refers to the pinching off of old blooms. The flowers which have already grown can be plucked and kept in a vase for its smell and looks. Diseases: Some bulbs in the market may not be healthy. This can happen if the bulb has not been dried appropriately and if they are soft when bought. When these bulbs are planted, they may rot as they are attacked as the bulb is less healthy and diseases are prone to occur in these plants. However, this problem can be solved by sporadically watering these plants with a dilute Chestnut compound. 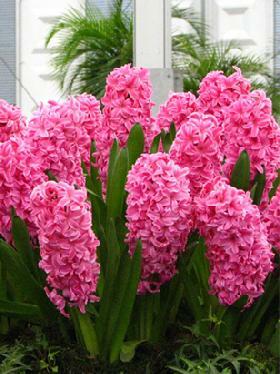 Pests: Usually hyacinths are grown outdoor and they don’t suffer from pest attacks when kept in the outside. However, problems can arise if they are planted in forcing conditions. They may be attacked by aphides and this can cause quite a lot of problems for the plant. These flies cause decrease in the height of the flower spikes and also damage the shape of these spikes. Nevertheless, this can be controlled by the application of nicotine fragments on these plants. The best time to apply nicotine is when the flower spikes just begin to sprout. Care: The Hyacinths are easy to take care of. they should be watered regularly, usually during the morning an evening. However, the soil must not be left soggy and the water needs to be drained well. the flower stalks should be cut after spring ends and the flowers have already blossomed. dead hyacinth leaves can be removed by pulling or cutting them. The damaged, dying flowers should be consistently removed to ensue longer life of the flowers. Compost should be put in the Hyacinth every year to make sure it gets the nutrients it needs. The plants should be planted in a place with a plenty of sunshine and a little shade. Uses: Many flowers belonging to the Hyacinth genus are found to hold medical uses. The Feather Hyacinth has been used since old time in medicinal field for its diuretic and stimulant properties. Another extremely useful Hyacinth flower is the Water hyacinth. It can be used for compost, firewood, cattle feed and water purification. Toxicity: Some species of Hyacinth is found to have poisonous properties. The chemicals responsible for the toxicity is concentrated in the bulb. When you eat a little amount of this bulb, you will suffer from stomach upset. Also keep in mind, this bulb can be harmful for animals too such as you pets. So, keep it out of the reach of children and pets. However, Hyacinth poisoning is very rare. The gastro-intestinal symptoms of poisoning are vomiting and diarrhea. Depression. Tremors, excitement, spasms, sweating, chills and dizziness are the other common symptoms of poisoning.